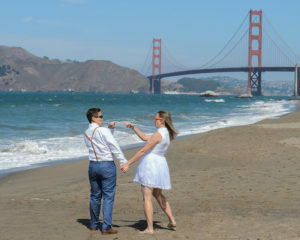 Once we completed the formal bride and groom photo shoot in the Marina District, we headed back to North Beach to begin the reception. The party was at the Italian Athletic Club which is a well known place for Italian wedding parties. In fact, my own parents had their wedding party there over 50 years ago. They always makes sure that there is a Pasta served and lots of other good Italian food. The dancing was mostly contemporary music with a few old Italian standards mixed in. They did all the normal traditional dances including the first dance and the father daughter dance. Then they went into normal dancing and the party got fun and wild. Lots of fun dancing and partying. This group seemed to be very close and really enjoyed each other. There was also a very strong family sense that I often see at Italian weddings. After the wedding, we stayed in touch with Jayne and Bobby and have seen them a number of times since. One of our favorite couples! I will admit to having a soft spot for big Italian weddings in San Francisco. As an Italian myself who grew up attending large Italian parties, I have experienced the amazing food and fun traditions. 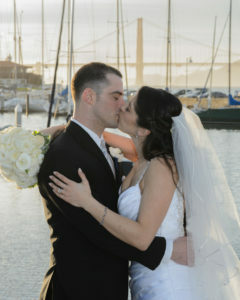 Through the years we have photographed quite a few Italian weddings in San Francisco and have enjoyed every one of them. 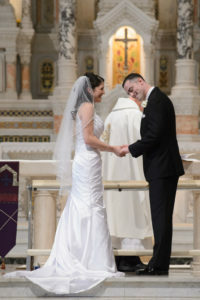 They most often occur in North Beach with a Catholic Ceremony at Saints Peter and Paul Church followed by a reception at the Italian Athletic club. Other notable spots for Italian weddings include any of the fantastic restaurants in the North Beach Area that can accommodate large groups. 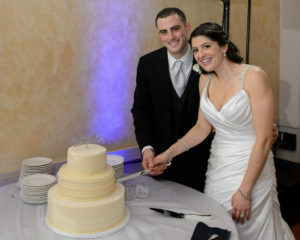 A more recent wedding that we really enjoyed being a part of was Jayne and Bobby Carini’s wedding. One of the most fun couples we have photographed and we are still in touch with them today. 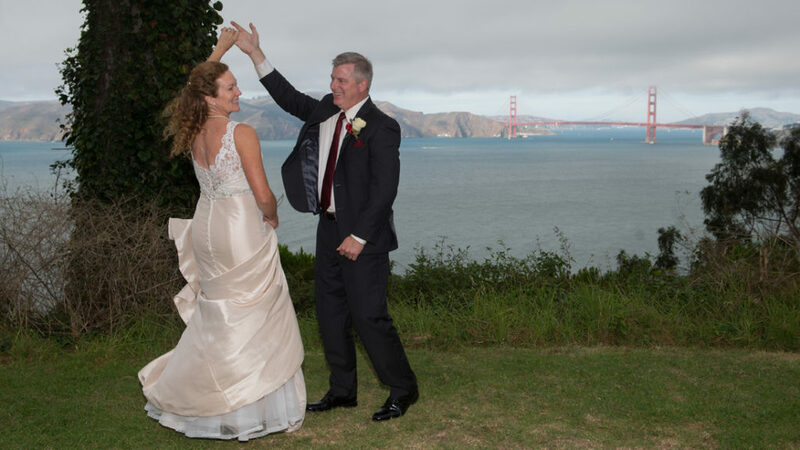 This entire wedding and ceremony took place in North Beach, but then we took them to the Marina for some photos. 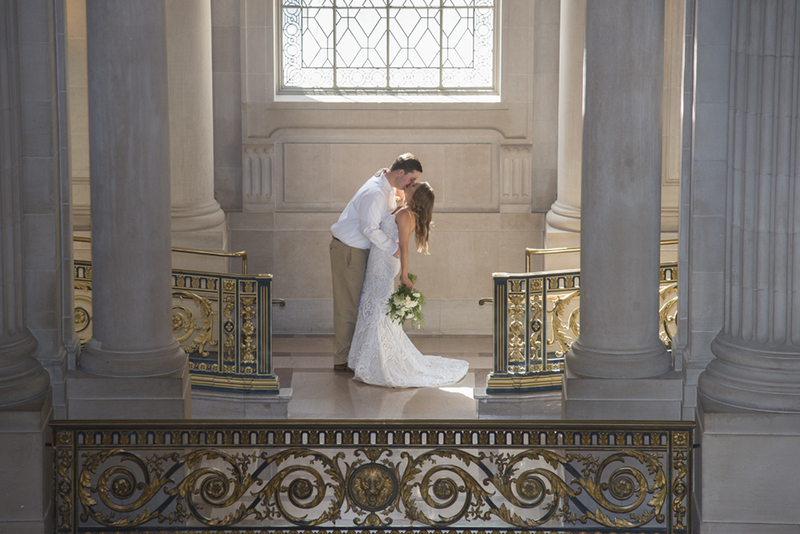 Here are a few sample shots from this great wedding in San Francisco. 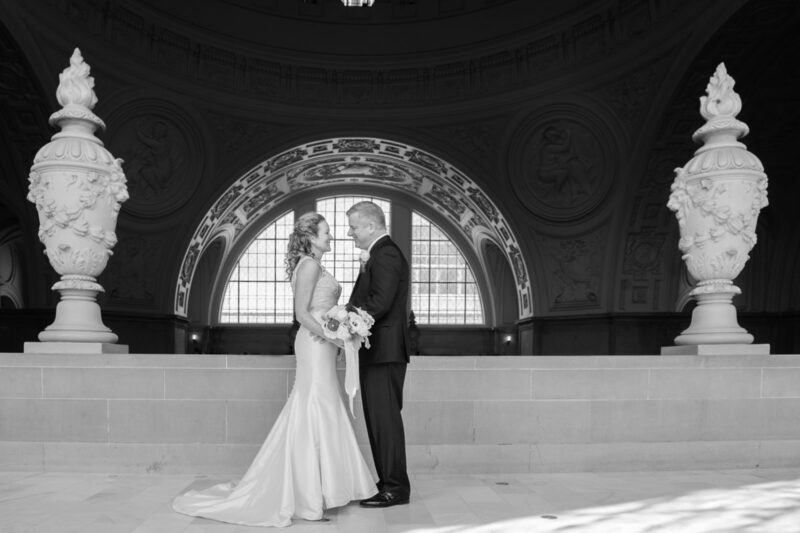 Once they completed their ceremony at San Francisco’s famed Church, we headed off to the Marina district to capture some nice photos. We also brought the entire wedding party with us so we could include them in the photos. It was a hazy day, but we were still able to catch faint glimpses of the Golden Gate Bridge in some of the backgrounds. After photographing the wedding party and best man and maid of honor, we focused on the bride and groom only. Here are a few shots from this section of the wedding. Part 2 coming soon…… The Reception and Italian Party! OK, so I used to photograph weddings with a 2 1/4 Hasselblad film camera. It was manual focus, manual exposure and the largest film magazine only held 24 exposures. 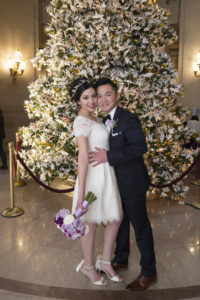 The biggest challenge in those days was getting the exposure right and producing sharp, well composed wedding photos. It took considerable skill and tons of practice. Clients were generally pretty happy if you delivered about 500 final photos that were in-focus and nicely posed. If you caught a few special moments, even better! There was a certain fear back in those days of hiring a friend or having Uncle Bob shoot your wedding. Why? Because of the horror stories involving amateur photographers delivering blurry photos or no photos at all! This fear became relief from clients when professional wedding photographers were able to deliver 500 + proofs in a nice preview album. I am certainly not suggesting that brides and grooms didn’t expect great photos back then. Yes, even then there was always hope for something better than simply “in focus” prints. There has always been different levels of wedding photography excellence and most of us strived to reach that type of success. My point is the pressure was not as great back then and you would be forgiven if you didn’t produce any great shots. This type of mediocre performance would not place you in the elite division of professional wedding photographers. But it would allow you to have a career in wedding photography and make a decent living. To avoid boring my audience with a long and tiresome history lesson on Digital Photography, suffice to say that in the late 90’s advanced types of digital cameras were starting to become available. For those readers who want more details, here is an excellent digital photography history for your perusal. Exceptional yet affordable digital cameras being made available to the public basically killed the old wedding photography industry as we knew it. The mystery was gone! Anyone could now take wedding photos and know that they would at least turn out. 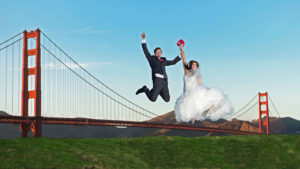 Professional wedding photographers throughout the San Francisco area and beyond began to see their bookings drop! I actually remember comparing notes with my fellow photographers regarding the number of weddings we had booked for the year. As each year went by, the numbers went down. Many wedding photographers closed their businesses. 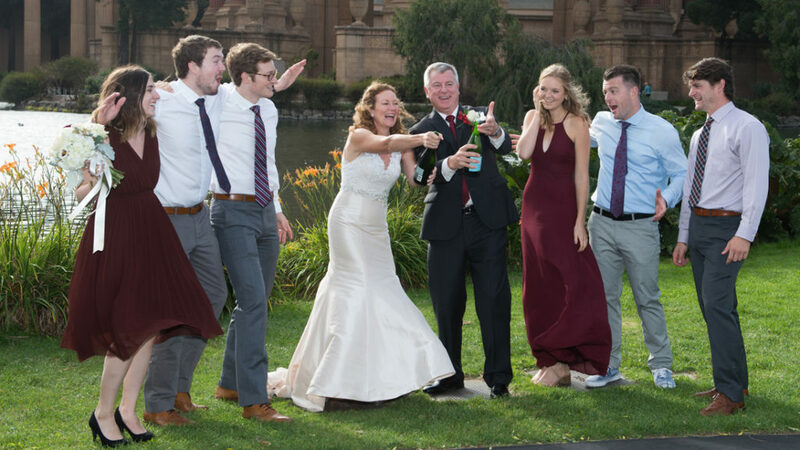 There were just not enough weddings to go around for all of us because so many potential clients felt confident in “Uncle Bob” shooting their wedding with his cool new digital SLR. For a professional wedding photographer to survive in what I call the Modern era, we had to offer our clients something more. How did we do it? Well, digital photography had one major advantage over film….. You could take all the photos you wanted and it didn’t cost a penny. This allowed pro photographers to take more photos and as a result, produce more candid photos. Thus, Wedding Photojournalism was born! Now we could shoot thousands of photos at every wedding and capture all the special moments and we didn’t have to pay $1.00 for each photo (approximate film era cost per photos was always said to be $1.oo each!) Books were published about this new phenomenon of Documentary wedding photography. Brides started asking us if our style was traditional or photo journalistic. I could go into a great detail about all of this and perhaps will in a future blog post, but for the purpose of this article suffice it to say that this was the hot style in the 1st decade of the 21st century. What I am about to write will be somewhat controversial among some of my fellow wedding photographers. It is my opinion that after a decade marked by thousands of brides having their weddings covered in a purely documentary style the result was considerable disappointment among many clients. As it turned out, it really wasn’t that difficult to take 3,000 photos at a wedding and catch dozens of “moments.” In fact, armed with a fully automatic digital camera and about 1 hour of training, virtually anyone could be a wedding photojournalist. Unfortunately this ease allowed hundreds of wedding photographers to enter the industry with no knowledge of lighting or posing. 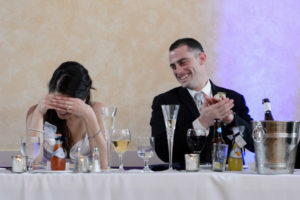 Clients soon grew tired of having to wade through thousands of candid wedding photos with no images really standing out. 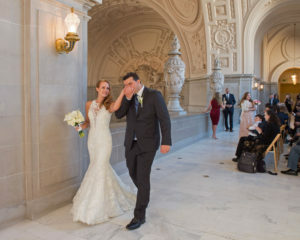 Did the wedding photographer capture some great moments? Of course they did! But how were the family photos, how was the lighting, were there any fun poses? Too often the answer was no! I believe that the post modern era of wedding photography began in the early part of this decade. It’s emergence was gradual yet definitive. 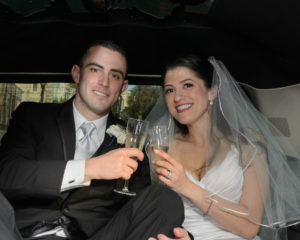 We began to approach wedding photography as an art form and not just an assignment. In fact, we even started calling ourselves artists! Randomly check out some professional wedding photographer’s websites and you will see that many people have changed the “About” section to “About the Artist”. 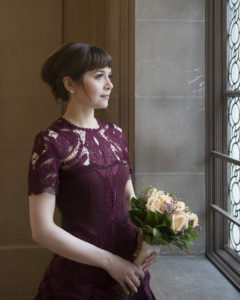 Many now refer to wedding packages as “Collections”. If you could still see wedding photography websites from the film era you would not see any of this terminology. If you aspire to be a professional wedding photographer in this era, you will need to be able to produce creative images with impact and beauty. You will also need to understand lighting, composition and posing. Machine gun candid photo shooters are still out there, but they will not be considered in the upper echelons nor will they command top dollar for their work. In a sense, the industry has come full circle. 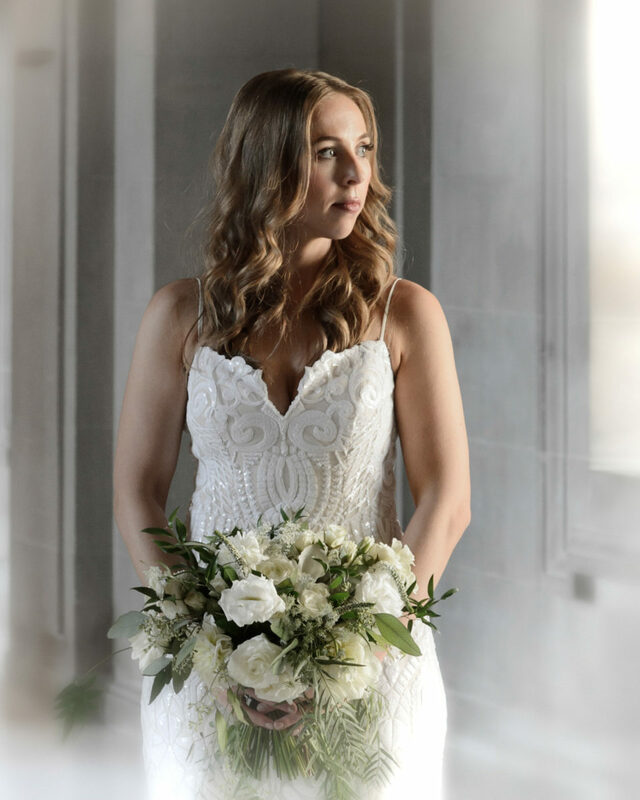 As was true in the film era, a successful wedding photographer will need to possess great skill, but with a difference…… The old Technical skill needed to operate ancient film cameras has now been replaced by the skill of an artist! Lacie and Brad had already eloped in Europe but wanted to still have a marriage ceremony in the US for their family and friends. They booked the Mayors Balcony so they could fit a large amount of people and have them seated comfortably. The cost to reserve the 2nd floor Mayor’s Balcony is only $1,000 and you get to have it for a full hour. Since this couple had already been married, they did not want or need an extensive photo shoot of the 2 of them. They were mostly interested in family pictures and wedding party shots. So after a wonderful ceremony, we started in on our extensive list of Family Photos and everyone really enjoyed getting together for them. Its nice when people genuinely seem to like being involved in group photos, it makes it much easier also! After completing the family photos we did a large number of wedding party shots. We did all the girls and all the guys and then paired each of them with the bride and groom. 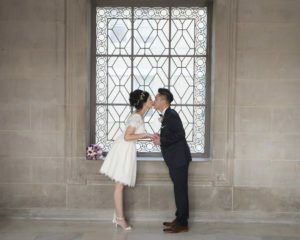 They were dressed in matching outfits so this particular city hall wedding really resembled a large formal wedding. 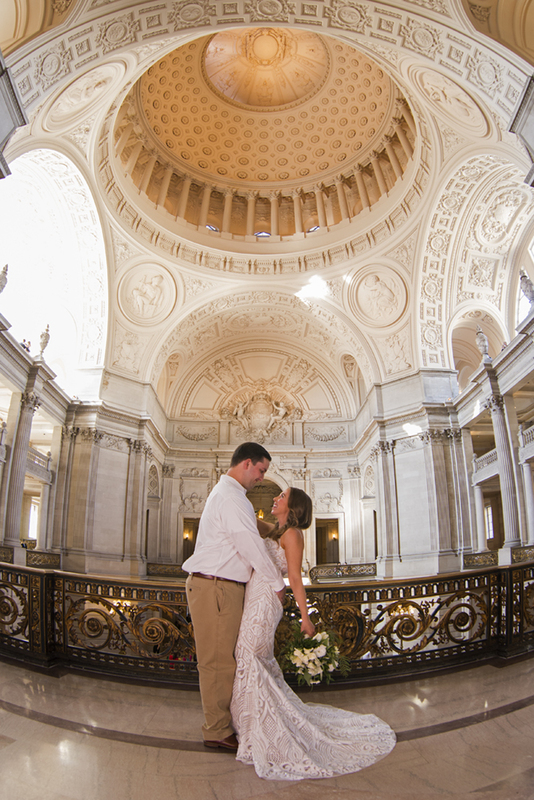 After completing this portion of the festivities we took this attractive couple on a mini tour of San Francisco City Hall. We still needed to get at least a few shots of them together. Another fun wedding today with Deb and Bart. The 2 of them made the trip to San Francisco City Hall all the way from Boise Idaho. Even more impressive was their children who basically came from all over the USA and even the world to watch their parents get married. 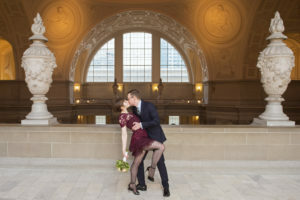 After a fun filled ceremony and photo shoot at City Hall we decided to head to our pre-planned photo tour starting at the Legion of Honor in San Francisco. We obviously could not fit all 5 of their kids in the car so we had to meet them there. When we first arrived at the Legion of Honor we noticed that it was getting foggy so decided it would be best if we went right into the Golden Gate Bridge photos that we had also planned to do. We took them to the 17th Hole at Lincoln Park Golf course which is a little more than walking distance from the Legion. The Tee Box here has a nice view of the bridge so we rushed down there to get our shots before our opportunity was completely fogged over. Action shots are always the best types of photos to get especially with a larger group like this one. The family will look at this shot for years and laugh at each of their expressions as the bottle was opened in celebration. We had quite a crazy week at city hall! Besides photographing 5 beautiful couples in only 4 days, we also had to deal with record temps! On Friday San Francisco hit the 103 mark which was an all-time record. We were lucky enough to have booked a wedding on that day and got to experience the incredible heat. Fortunately, City Hall is slow to heat up and also slow to cool down. Often the day of the heat wave, the building never gets up to unbearable temperatures, but watch out for the following day! If the famous San Francisco fog doesn’t roll in, the building will heat up like an oven. All of that concrete and marble tends to hold on to the heat, but the whole process takes a while. Thus, we really had our hottest shooting day at City Hall the following days after the heat wave. I have to say that our couples all handled the heat very well and were good sports. Some of the guys with their tuxes were clearly suffering a bit, but they never let their bride see any extreme discomfort. We purposely tried to keep our normal shooting pace slow, to keep everyone cool. I have a tendency to walk fast through the building, but not this week! 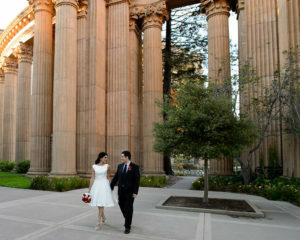 It was a relief on Thursday to leave city hall and head out to the Palace of Fine Arts. We had a feeling that once we got there, it would be cooler given its proximity to the Bay. We were not disappointed when we were greeted by a nice cool breeze. With so many weddings this week to talk about, I will end this post here, but promise to pick it up again tomorrow and talk about some of our other couples for the week. Thanks for listening!